You! This new therapy is a non-invasive method of treating sports injuries or persistent pain in the shoulder, elbow, heel spur, lower back or patella (kneecap). ‘Tennis Elbow’ (epicondylitis) and tendonitis are also commonly alleviated by Shockwave Treatment. First of all, it’s important to explain that the acoustic waves applied to the affected area of the body are not used to disintegrate tissues or ‘attack’ muscles. Instead, the Shockwaves cause tiny microscopic biological effects including tissue regeneration. It is reccommended that you have a minimum of three sessions of Shockwave for most complaints. You can book a course of three sessions with us today for only £150. IS SHOCKWAVE THERAPY SUITABLE FOR ME? As well as being an ideal solution for tennis elbow, we recommend Shockwave Therapy for acute conditions such as frozen shoulder and achilles tendonitis. Your therapist will apply the treatment directly to the outside of your body in a carefully targeted process that will send an acoustic ‘shock’ wave in a single pulse to the problem area. The acoustic wave produced by the equipment in our Arnold (head office) clinic has an extremely high energy peak, with a very large pressure amplitude. With its single high intensity pulse, Shockwave Treatment differs from ultrasound, which usually consists of a periodic oscillation. It is an effective, non-invasive way to treat chronic pain in patients particularly useful when the area that needs treating is relatively small or ‘localised’. A common question we are asked is ‘Does It Hurt?’. It is typical for a patient to experience some initial discomfort but that should only last 24 hours or in most cases, much less. A total course of five treatments, each about a week apart, achieves optimal results. 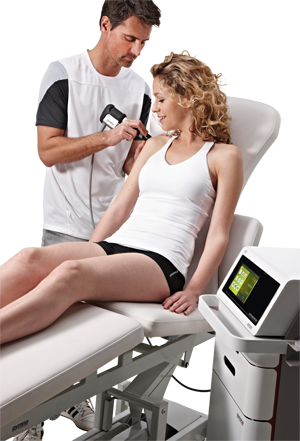 Specialist Shockwave Treatments for Sports Injuries. HOW SUCCESSFUL CAN TREATMENT BE? Success Rates: a 90% improvement was recorded for the treatment of Plantar Fasciitis (heel pain) by the Journal of Orthopedic Research (2005). The same publication quotes a 77% success rate when treating Tennis Elbow with Radial Shockwave Therapy and other clinical studies have generally reported a success rate of in excess of 75%. More Information: We will be very pleased to provide you with additional information and can include references to other major healthcare providers. For example, see: Nuffield Health Website for their ‘introduction to Extracorporeal Shockwave Therapy’.